Over the course of the last two years I have on a non-stop path to health. I’ve lost nearly 70 lbs through watching my diet, regular exercise and just generally taking better care of myself. Part of that exercise plan has been walking. I try to walk at least 10 miles per week along with other with other types of exercise (Dance Central on XBox anyone?). 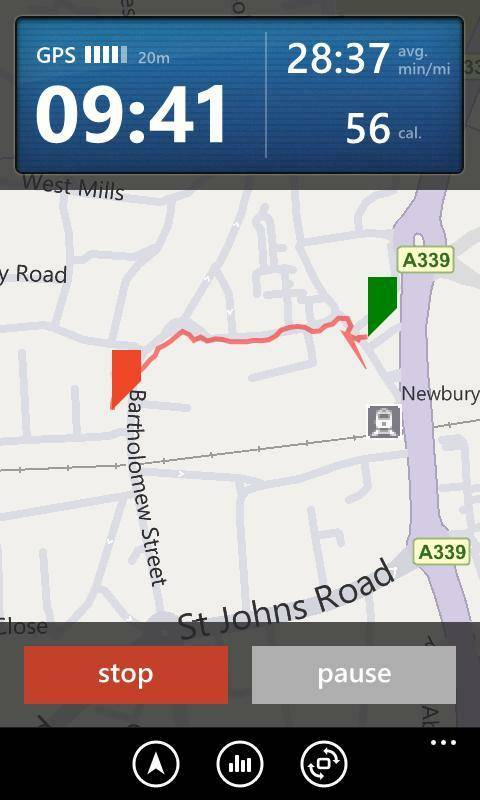 The app I have been using to help me keep track of my walking has been RunKeeper. I started using it when I was using an iPhone as my daily phone and now that I’ve moved back to Windows Phone, it was one of the first apps that I downloaded from Marketplace. The app, which ties into the RunKeeper website, uses my phone’s GPS to track my walking while I’m on the go then stores the information on the RunKeeper site so I have a historical record of my walks and overall progress. Frankly I loved this app on my iPhone and after using the app on my Windows Phone, I have to say that I like it even better. The app, like the RunKeeper service itself, is free and provides you real time information as you walk, run, bike, hike, ski, skate, mountain bike or allows you to enter information as you work on an elliptical amongst other activities. It is both accurate in the calorie count and distances measured, something that is a must have in this type of app. Add that to an impressive Live Tile function and you have a winning app that will help you track your exercise and keep you motivated. 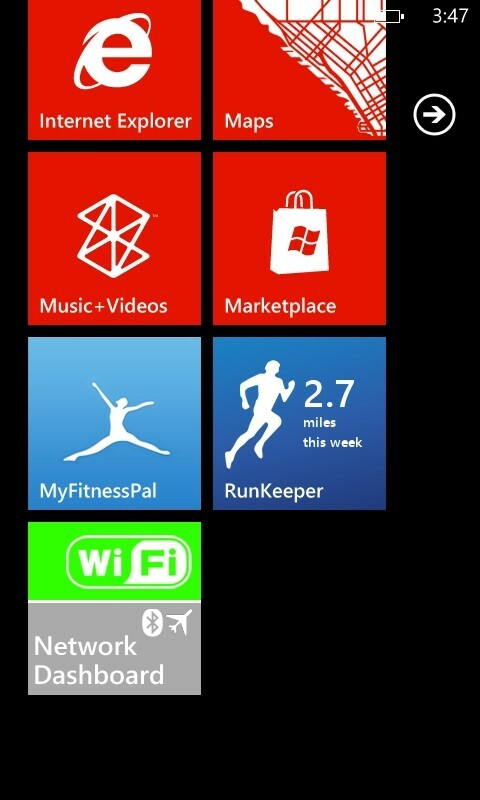 RunKeeper requires about 1MB of storage on your Windows Phone and works with both 7.0 and 7.5 (Mango). 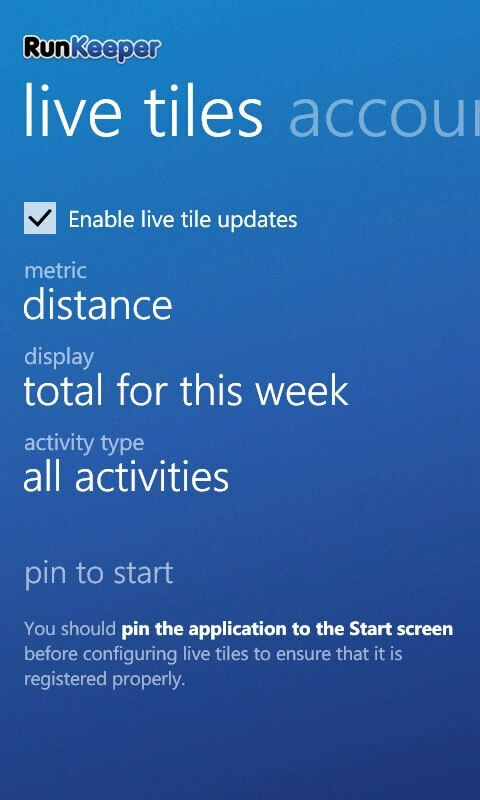 To get the Live Tile function I mentioned before the break, you will need to be running Mango. The app also requires a RunKeeper account on their website. This is free as well. With your RunKeeper account set up in the app, the first screen you will see will be the Activity screen. This is where you select the type of activity you are going to do for your exercise. To change the activity, tap the activity type and you will be presented a list that you can scroll through to select what you will be doing. For some of these exercises you will only be able to put in information and not necessarily have your phone’s GPS track you. After all, standing stationary on an elliptical machine doesn’t really need a GPS! In my case I have selected Walking. To start an activity just tap the Start Activity button. Immediately the app begins tracking your pace, speed and progress as you exercise. 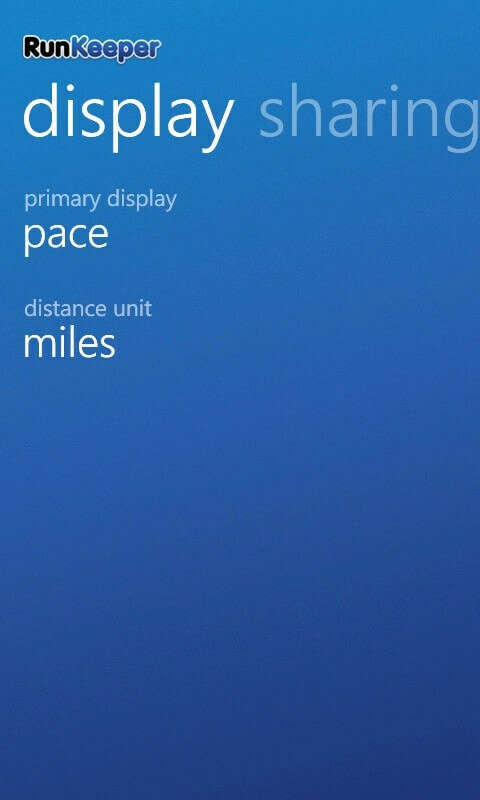 You will be able to see in near realtime these readouts, helping you determine if your pace is to fast or to slow. In addition you will see the time that has passed along with an estimated calorie burn to that point. You can also chose to see a map of your progress. When you have completed the activity, tap the Stop button and RunKeeper will ask you if you want to add any notes to that activity. Here you can put notes about the weather or how you felt during that exercise, which will be available to you in the History section of the RunKeeper website. 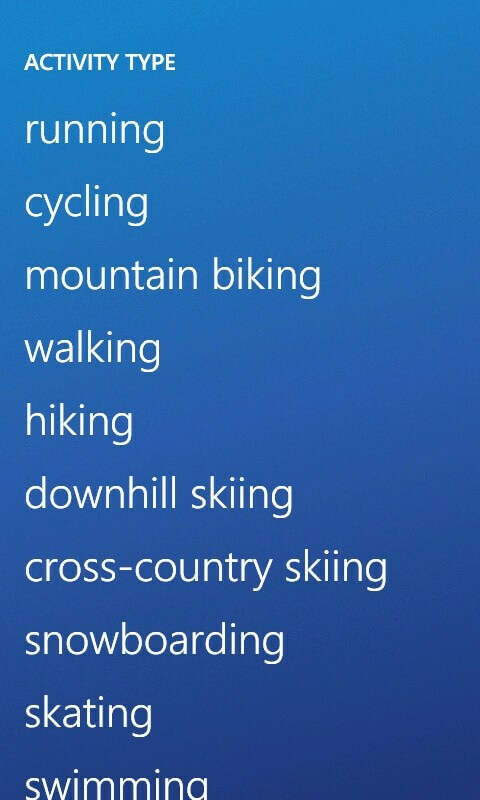 The History section of the RunKeeper app allows you to see all of the activities you have had using the app. The good thing is that this is all stored on the RunKeeper website. That saves you on storage but it also keeps all of your history independent of which device you are using. In my case, I used RunKeeper on my iPhone and on my Windows Phone. The history from both devices are available for me to review. If you want to review an activity, just tap it and it will be downloaded to your phone. Much like the real time information, you can view your pace, total distance and calories burned as well as a map outlining the path you took on that run, walk or bike. In the Settings section of the RunKeeper app you can set up the app to be more personalized for your needs as well as integrate the app with social networks. For example, you can chose what information is displayed during an activity (Pace versus Speed), if you want an activity summary to be posted to Facebook or Twitter or to the RunKeeper website. Equally as important, you can chose who can see the information on the RunKeeper site so you are not necessarily making the walk around your neighborhood open, public knowledge. 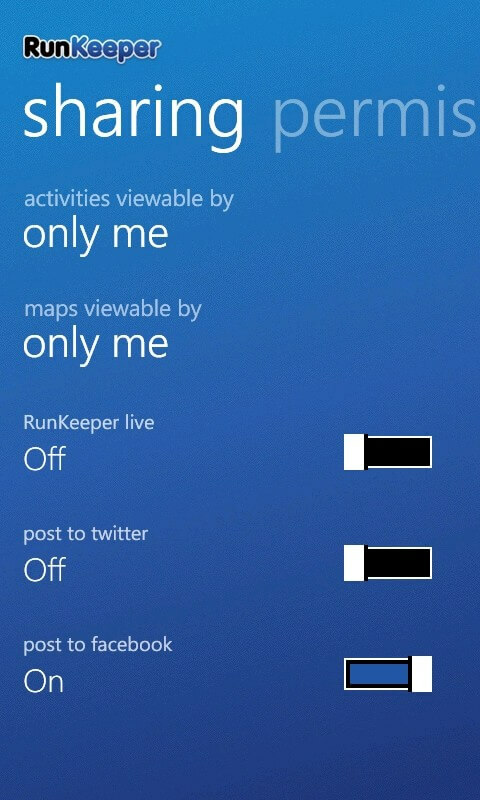 One of the great features of the latest update of the RunKeeper app is the extensive use of the Live Tile. 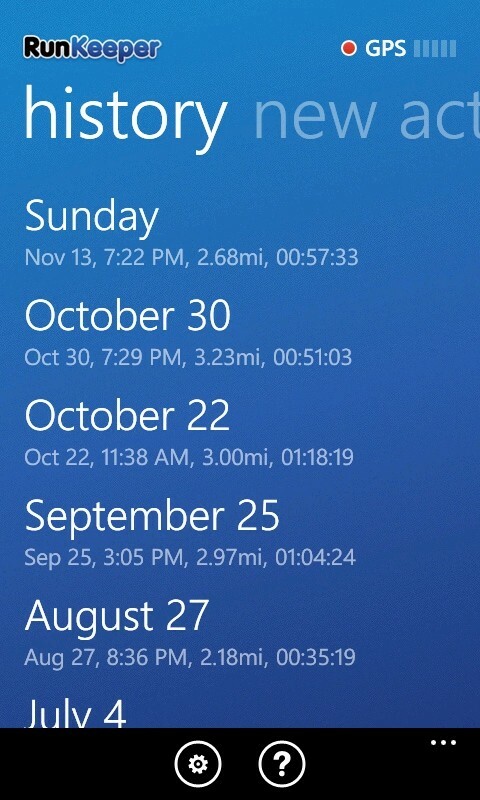 By pinning it to your Start screen, the Live Tile can display your exercise totals for this week, month or your best activity. Once you have it configured the way you want, pin it to your Start screen where you will see that motivational total. It is a great way of utilizing the Live tile function in Mango. One other key point to bring up about RunKeeper on Mango. You can run the application in the background while you have your music playing at the same time. 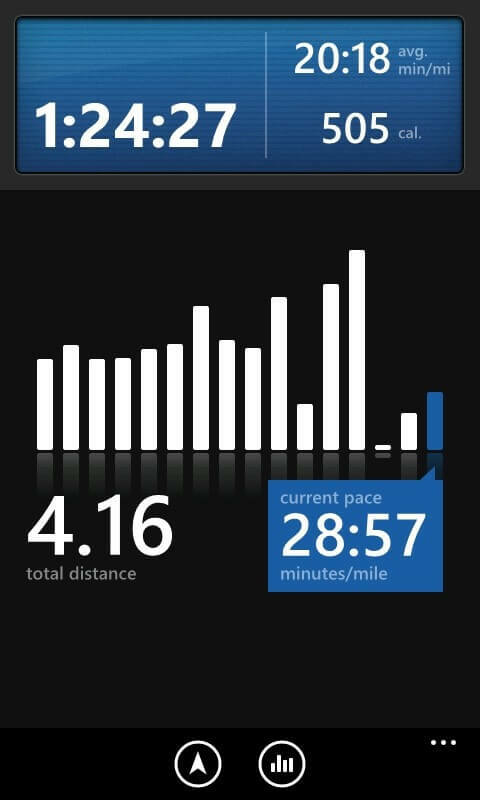 If you are looking for an app on your Windows Phone to keep track of your exercise history, give RunKeeper a serious look. I’ve been using it for over a year now and really have grown to appreciate it.